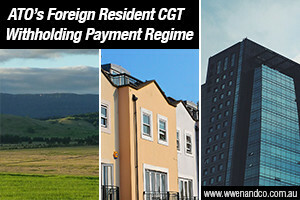 Details of how it will administer the new foreign resident C.G.T. withholding payment rules have been released by the ATO. The new withholding rules will apply to contracts entered into on or after 1 July 2016. When a foreign resident disposes of certain taxable Australian property, the purchaser will be required to withhold 10% of the purchase price and pay that amount to the Australian Taxation Office (ATO). The same requirement also applies where the disposal of such taxable Australian property by a foreign resident generates gains on revenue account and, as a result, is taxable as ordinary income, rather than as a capital gain. Real property in Australia – land, buildings, residential and commercial property. Lease premiums paid for the grant of a lease over real property in Australia. Mining, quarrying or prospecting rights. Interests in Australian entities whose majority assets consist of the above such property or interests. Real property transactions with a market value under $2 million, ensuring that the vast majority of residential house sales will be unaffected by this measure. Transactions listed on an approved stock exchange. Clearance certificate application for Australian residents. Variation application for foreign residents and other parties. If you have any questions about Capital Gains Tax withholding rules for foreign residents, please contact our consultants at W Wen & CO Chartered Accountants.